In the USA the 1930 wealth destruction was lead by deflation: the dollar went up. 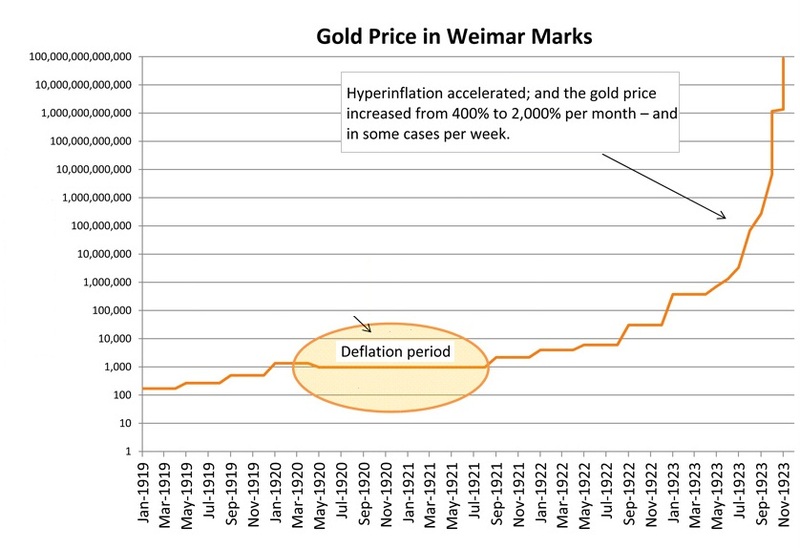 In 2008/09 wealth destruction is lead by Weimar style inflation: the dollar will come down! It is not however the case that the economy within Germany continued to decline throughout the whole of the period 1919 – 1923. In 1920 the currency stabilized for a period of some 6 months. *The mark actually gained in value against foreign currencies, so that prices of imported goods (commodities) fell by some 50%. The price index remained almost constant and the value of the German mark improved to approximately 1US$ to 69 German marks. The Weimar Government, it has been argued, could have introduced a stable currency at this point. Instead they continued to increase the amount of money in circulation – which is inflationary. The result was hyperinflation in 1923.